Home BREAKING Just In News: Arestado dahil sa Rebellion! FAJAD UMPAR SALIC, ang ex-mayor ng Marawi, natimbog ng mga awtoridad! Just In News: Arestado dahil sa Rebellion! FAJAD UMPAR SALIC, ang ex-mayor ng Marawi, natimbog ng mga awtoridad! Joint AFP-PNP operatives capture this evening, 7 June, FAJAD UMPAR SALIC, the 11th most wanted person in the country, for charges of narco-politics and violation of Article 134 (rebellion). 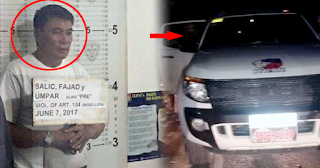 Salic was with three other persons onboard a white Ford Ranger with plate number AFA1151. He was on his way to Cagayan de Oro from Butuan when apprehended at the PPSC checkpoint at Brgy. San Martin Villanueva, Misamis Oriental.